These "mini-camps" for those entering Kindergarten through Second grade are perfect for students who want an introduction into the world of musical theatre and to learn what it takes to perform in a show. 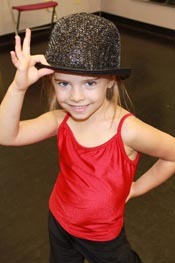 Campers will study age-appropriate music & choreography and WILL PERFORM THEIR NUMBER ON STAGE! Each 1-week session will perform one production number in one of the older students' mainstage theater shows. Come for smiles, songs, dance, and a ton of fun! Students are welcome to attend both sessions and will learn a different production number in each session.